It’s a blistering July day in Phoenix and my chunky Bugaboots are drawing a few curious looks in the airport. But it’s winter in South America, and I’m headed to South America on a Puma tracking in Patagonia expedition with Quasar. It’s my first trip to Torres del Paine, a 900-square mile park in the heart of Chilean Patagonia. About 50 of the massive cats make their home in Torres, and winter is the best time to see them. The lure of tracking pumas in the wild draws me to the literal end of the world in the middle of a Patagonian winter. My adventure begins as I take my seat on the Airbus 320 and start writing my journal. Day 1: Santiago was an unexpected explosion of color. The markets did not disappoint. Santiago is nestled against the Andes and the Gran Torré dominates the city skyline, even from the air. I’ll spend my first night in South America in this incredible city browsing the Centro and taking in the sights and smells of Mercado Central. The public transportation system here is surprisingly efficient and well-planned. Grab a Bip! card (similar to the Oyster card in London) and jump between metro and bus so you can see more of the city. Tomorrow’s an early flight to Punta Arenas (Patagonia at last! ), but I did treat myself to ceviche and a pisco sour at the market before turning in for the night. Morning, Day 2: Met our Puma tracking guide in Puerto Natales before heading to Torres del Paine. Landing in Punta Arenas, I was glad to find Quasar staff waiting for me. Punta Arenas is just the first stop on the journey to the park—a good five hours away. But it was time well spent with our puma spotting guide Diego Araya. Diego is one of Quasar Expeditions' three expert guides; he’s been leading puma tracking expeditions in Patagonia for many years. Although most Patagonia excursions happen during the summer and fall months, Diego prefers the winter safaris. Pumas are nocturnal creatures, so the best time to see them is at dawn (when they’re returning from their hunt), or dusk (when they are leaving their caves and resting places to set out on their hunt for the night). We’ll go out for our game drives in the mornings and evenings. As the days are much shorter in the winter than the summer, with sunrise at 7am instead of 4:30am and sunset at 7pm instead of 11pm, this gives us plenty of time to rest each night before a day of puma tracking. Diego runs me through his non-invasive approach to tracking Pumas—find the places where the Guanacos forage and you’ll likely find a Puma. Guanacos, caramel-colored, Llama-like animals, congregate near Sarmiento Lake and other areas in the park lower down the mountains to feed on shrubs and lichen. Diego is our guide, but we also have our own dedicated Puma tracking expert, so we won’t just be spending the day roaming the Puma lands, hoping for a sighting. Instead our puma expert will radio in when he spots one. So we’ve made some plans to explore other areas of Torres Del Paine, I can’t wait to see more of this beautiful park. Afternoon, Day 2: Off to our Jeep! Our first game drive is underway. A quick check-in at the Explora Lodge blew away my expectations. I had heard that all the “good” hotels closed for the winter season, but the Explora is spacious and luxurious—there’s even a spa. The lodge is situated on the shores of Lake Pehoe with mind-blowing views of the Paine Massif. My accommodations are a welcome surprise and I’m looking forward to a warm soak tonight (and a glass of Chilean wine). Diego is waiting for me—we’re about to take our first game drive in the park in one of Quasar’s specially outfitted Jeeps. My first glimpse of Torres del Paine in winter is unforgettably beautiful. The snow sparkles like diamond dust and there’s a hushed beauty here. The sky is a deep blue color I’ve never experienced before. We are in a hurry to Sarmiento, and with luck, our first Puma sighting. Day 3: Up before dawn for a game drive and rewarded with our first look at a Puma. Although we saw no Puma on our first drive last night, we did see shaggy red culpeo fox—Diego explains winter is their mating season. Today, however, we are out before the sun with the hope of catching the Puma at their most active. And we are richly and unexpectedly rewarded! Just minutes from our hotel, we see a massive cat scrambling up a rocky ledge to the left of our Jeep. He turns to stare at us—for just a second—and there’s an adrenaline rush I can’t explain. These are the least seen of the world’s big cats and yet...there he is, looking me seemingly eye to eye. We continue our journey. Diego is listening for the Guanacos’ bleating—he’s learned to tell the calls that indicate a Puma may be nearby. A huge male Guanaco stands sentinel over the heard on a mountaintop above us. Evening, Day 3: Photographing the sunset—an unforgettable experience. We did not see another puma on our morning adventure, but I was able to catch shots of the Culpeo setting out on their hunt. We returned to the hotel for a hearty lunch and a nap—we’re headed out just before sunset to try again. Diego finds a Guanaco carcass, a sure sign that puma have been nearby. But it’s old, at least a day or so. The Puma has moved on in search of another meal. I am strangely not disappointed. The mountains, the lightly falling snow, the sunset—I shoot hundreds of photos, there are no bad angles here. The solitude is immense and beautiful. I am grateful my first experience here was during this silent season...it would be diminished, somehow, if the place were crowded with tourists. Day 4: Success! A second Puma spotting in Patagonia on the western shores of Sarmiento Lake. Today is a full day tracking Puma around Sarmiento, the largest lake in the park, and a gathering place for guanacos. I’m stunned by the rich, sapphire blue color—Diego explains the lake’s color is because it is fed by rain, not glaciers, unlike most lakes in the park. I catch my first sight of the rheas, tall, Emu-like birds, clustered around the lake. And then it happened. Alerted by a flock of Condors circling, Diego points to a Puma scrambling up a hill. It has just finished gorging on a kill—hence the circling condors—and is headed to a quiet place to rest for the day, its belly full, until night falls and the next hunt begins. Day 5: Dusk to dawn wildlife parade—perhaps my favorite day of the journey. My fourth day in the park was surreal. Diego took us to see the three granite towers, or Torres, that inspired the park’s name. In summer, people queue up to see the massive towers, but on this surprisingly still winter day, we had the park to ourselves. I ask Diego if it’s always so calm; I’ve heard stories about the crazy Patagonian winds. He tells me that the wind is much quieter during the winter months, and with the sun high in the sky, it feels almost warm without the driving winds. I take off my outer jacket and begin snapping photos. Above us, condors and caracaras circled overhead. Owls perched in the trees. Now and then a gray fox trotted by. A roly poly skunk scratched at the ground with his sharp claws. As sunset drew near, I captured a nearly perfect photo of a Guanaco silhouetted against the towers, the sun making the animal’s reddish fur glow. Day 6: Today we tackle Grey Glacier. Don’t let anyone tell you Grey Glacier is less than spectacular in the winter. 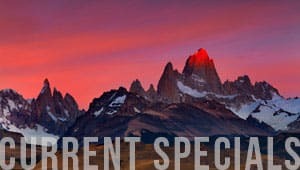 After four days in Torres del Paine, I was ready for another bucket-list adventure. We walked the beach of Lago Grey, boarded our catamaran and in just 30 minutes I came face to face with the mighty Glacier Grey and her icebergs. It’s my last night in the park, at the Explora lodge...I plan to wander Lake Pehoe and look for the Salto Chico falls near the hotel. Trivia for my next visit: The lake is pronounced “pay-oh-way.” The outdoor jacuzzi overlooking Paine River is inviting me for one last relaxing soak before I check out in the morning. Day 7: After a sunrise photo session, we head to Puerto Natales. Although I’ve woken to the same views for six straight days, I never tire of sunrise over the mountains, its crimson reflection on Lake Pehoe. I vow to return here for a photography safari and hike to the base of the three towers—yet another bucket-list adventure. The drive to Puerto Natales is uneventful; I’m sorry to leave Torres behind but glad that I’ve booked an overnight in the city. There’s so much more to Patagonia than the parks and I intend to have a full day exploring this unusual little town. Day 8: Our horseback excursion around Laguna Sofia was beyond incredible. There’s something oddly intimate about exploring Patagonia on horseback. There’s a feeling of oneness with your surroundings, and yet you feel infinitesimally small. We rode for hours through the Lenga forest and circled the glacial terraces around the lagoon. Near Mount Benitez, our guide pointed out a condor’s nest in the steep vertical walls. I return to my hotel exhilarated and unexpectedly sad to be leaving this immense and unknowable place. Day 9: Homeward bound from Santiago with 'Memories that last a lifetime'. My Patagonian adventure ends as it began, journaling from my seat on the Airbus. Except this time, I’m leaving Santiago behind. It’s difficult to write about my experience...the memories are so incredible, each more so than the other. My first sight of the powerful, secretive puma...sunset over the towers...the odd bleating of the Guanacos warning one another of the presence of a predator...the busy gray fox and the clever Culpeo...the menacing face of the massive condors. The friendly baqueanos and the sturdy Patagonian horses. I know, deep in my bones, I will be back here again. Ready for your own Puma Spotting in Patagonia adventure?